One of the city’s most popular skyscrapers, 30 Rockefeller Plaza, lit up Wednesday evening with a new corporate name: the Comcast Building. The rooftop signs on the 70-story building replace the General Electric initials and add the company’s logo and the NBC Peacock logo to the New York City skyline. It's the first time that the iconic peacock has appeared on top of the television network’s historic headquarters. The day is historically significant for NBCUniversal and NBC 4 New York, the flagship station of NBC's Owned Television Stations division. On July 1, 1941, 30 Rockefeller Plaza was home to the first commercial television broadcast, with WNBC, then called WNBT, offering a lineup that included a Brooklyn Dodgers versus Philadelphia Phillies baseball game and Lowell Thomas reporting the news from Studio 3H. NBC 4 New York still broadcasts from a studio on the third floor, Studio 3C. This is the third name for the building, which is nicknamed 30 Rock. It was called the RCA building beginning in 1937 after the company that founded NBC. It was then renamed for GE in 1988. GE created the Radio Corporation of America in 1919, owned it until 1930 and reacquired it in 1986. The most important building in television history now boasts one of the most iconic logos in the industry. And for the first time in history, the NBC peacock lights up the New York City skyline. Lester Holt has a preview. Comcast bought GE’s stake in NBCUniversal in 2013. “I remember when it said RCA up there,” said Michael Miscione, the Manhattan borough historian. “The fact that they’re bringing GE down is just one step in a many decade evolution of the signage on the building." The new signs use custom, energy-efficient LED lights that mimic the exposed neon look of the building’s previous signs. The Comcast letters on the north and south sides are 12 feet high, topped by an 11-foot-tall NBC Peacock. The peacock on the western facade is 18 feet high. The Comcast name is also on the granite at the entrances to the 850-foot building. Conceived by John D. Rockefeller Jr as a “city within a city,” Rockefeller Center was constructed during the Great Depression, according to the center’s website. It officially opened in 1933 and came to feature the annual Christmas tree and the ice-skating rink. 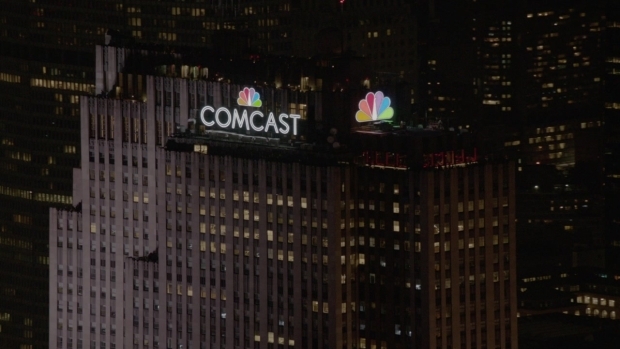 30 Rockefeller Plaza in midtown Manhattan has officially been renamed the "Comcast Building." 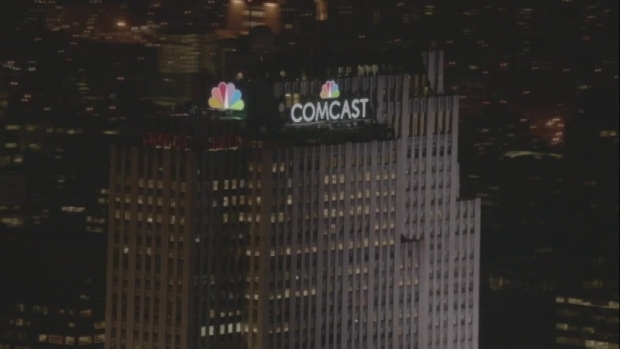 Watch as the new rooftop signage, featuring the Comcast logo and the NBC Peacock, is illuminated. The Art Deco lobby of 30 Rockefeller Plaza is decorated with murals by European artists Frank Brangwyn and Jose Maria Sert.